Lawn level memorial markers are set flush to the ground, and are the smallest of the memorials that we offer. While not as large as other memorials, memorial markers still commemorate your loved one with the beauty and eternal endurance that you would expect from a tribute. And we at Ohio Monument know that memorial markers hold the same significance to you as any other memorial. Though flat memorial markers are limited in size, this does not eliminate the opportunity to personalize memorial markers in several different ways. Lawn level memorial markers come in a wide variety of granite colors and designs, from religious affiliations to your favorite sports team. Let the designers at Ohio Monument create a lasting tribute to the one you love. Pink Granite Companion Marker With Cross And Rose Carving. Blue Granite Single Marker With Country Road Carving. Blue Granite Companion Marker With Ohio State College Emblem And Angel Carving. Black Granite Single Marker With Laser Etched Portrait And Angel. Single Gray Granite Marker With Carved Single Rose. Single Brown Granite Marker With Rose Carving. Single Red Granite Marker With Cross And Praying Hands Carving And Bible Verse. Companion Marker In Black Granite With Car Diamond Etching And Engraved Christian Crosses. 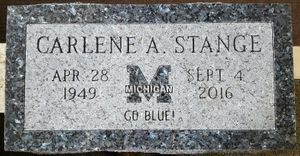 Gray Granite Companion Marker With Cross And Flower Carving..
Blue Granite Single Marker With Michigan College Sports Emblem Carving. Red Granite Companion Marker With Carved Cross, Wedding Rings And Marriage Date. Red Companion Granite Marker With Carved Wheat And Cross. Single Black Granite Marker With Diamond Etched Portrait. Black Granite Single Marker With Diamond Etched Eagle And Celtic Cross. Brown Granite Single Marker With Fishing Scene. Red Granite Single Marker With Cardinal Carving. Gray Granite Single Marker With Carved Praying Hands. Blue Granite Single Marker With Carved Turtle. Black Granite Single Marker With Laser Etched Family Portrait. Black Granite Single Marker With Diamond Etched Portrait. As you think about choosing a memorial fitting for your life or the life of a loved one, please remember that we are here to answer any questions you might have along the way. We have the knowledge and experience necessary to make this process as easy as possible, as unfamiliar as it might be. We would be glad to visit you in your home, or we would welcome you to any one of our studios. We are happy to do whatever is the most convenient for you. Contact us by phone or email to learn more about your options for a lawn level memorial marker. Please don’t hesitate to call with any questions; we look forward to serving you.